Don't let the name mislead you -- this exercise will not turn you into a super hero. But it will give you a stronger back and core. Named for the position of the legs and arms, like Superman flying through the sky, the exercise targets the erector spinae, a group of muscles that extend from the base of the skull to the sacrum. Practice this exercise a few times a week to build lower back strength, prevent back pain and improve your posture. As you age, it's common to experience back pain. Structures in the back degenerate, and the effects of gravity, desk jobs and a sedentary lifestyle can take their toll. Even if you're very active, the lower back is often neglected in average fitness routines. Strengthening the lower back with the Superman exercise builds support and stability for the spine, and it can also prevent and reduce back pain, according the Cleveland Clinic website. Electromyography tests that measure muscle activation during exercise show that among body weight exercises the Superman exercise is one of the best for training the erector spinae muscles. All you need is some floor space and an exercise mat. 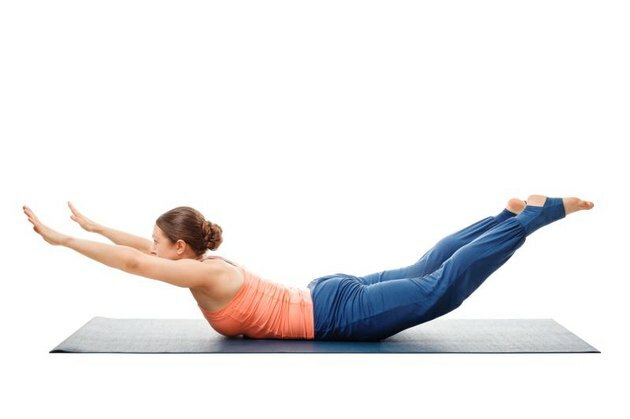 Lie on an exercise mat on your stomach. Bring your legs together and extend your arms overhead so your biceps are alongside your ears. Using the muscles of your back with a little help from your glutes, raise your legs and torso off the ground. Keep your legs straight and reach your fingertips away from you. Hold at the top of the exercise for five counts. Lower back down to the ground with control. Repeat for a total of 10 repetitions. Contraleteral is a fancy way of referring to opposite sides of the body. In this version, you'll lift one leg and arm at a time instead of both together. Lie on your stomach on an exercise mat with your legs together. Extend your arms overhead. Using your back muscles, lift your right arm and your left leg off the ground. Hold for a second at the top, then lower your right arm and left leg. Next repetition, lift your left arm and right leg. Continue to alternate for a total of 20 repetitions. It's important to use a slow and controlled motion for this exercise -- no jerking. Exhale as you lift up and inhale on the way down. If holding at the top, continue to breath shallowly, as best you can. Keep your neck long and in line with your spine. While this exercise naturally involves the use of the glute muscles, the emphasis should be on the back muscles. If you notice your glutes are very tight, release them. If You Don't Have Muscle Soreness, Does It Mean That Exercise Is Not Working? Can You Break Up Fat Cells?